VYBORG, Russia, April 9, 2010 (ENS) – Construction has started on the underwater section of a controversial new gas pipeline that for the first time will deliver Russian natural gas to Western Europe without passing through transit nations. 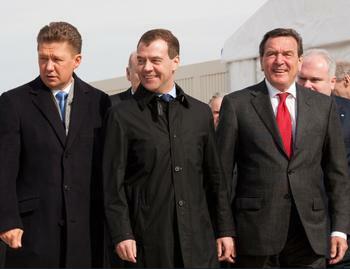 Today in Portovaya Bay, near the town of Vyborg just south of Russia’s border with Finland, dignitaries from Russia and Europe took part in a ceremony marking the start of construction of the Nord Stream gas pipeline’s underwater section. The pipeline will be laid at the bottom of the Baltic Sea and will cross the economic zones of five countries: Russia, Finland, Sweden, Denmark, and Germany. The pipeline, which will run from Vyborg to Greifswald in eastern Germany, will be 1,223 kilometers long and able to transport up to 55 billion cubic meters of gas a year, enough to supply more than 25 million households in Europe. The first pipeline in the twin pipeline project is scheduled to come on line in 2011, and the second line will start operation in 2012. Russian President Dmitry Medvedev said at the ceremony that the gas pipeline will not only be a real contribution by Russia to Europes energy security but is environmentally safe and will help to combat global climate change. “Nord Stream is not just a big transnational commercial project but is also our contribution to resolving environmental and climatic problems not just at the regional but also the global scale,” the Russian president said. “Increasing the share of natural gas in Europes energy balance will make it possible to reduce emissions of pollutants into the atmosphere and, something I particularly want to emphasize, help us to achieve our goals in fighting climate change without detriment to the economy,” he said. The Nord Stream consortium is made up of Russia’s Gazprom, 51 percent; Germany’s BASF and E.ON, 20 percent each; and the Netherlands’ Gasunie, nine percent. Last month agreements were signed with 26 international banks for 3.9 billion euros of commercial loans for phase one of the project. The first of the pipeline’s 100,000 25-tonne 12 meter pipe sections were welded together and laid on the bed of the Baltic Sea some 30 kilometers off the Swedish island of Gotland and the vessel Castoro Sei is currently laying the pipeline at the rate of 2.5 kilometers a day moving towards Finnish waters. However, the formal celebrations to launch the construction phase took place on land at Portovaya Bay near Vyborg, which will be the start of the pipeline. Taking part in the ceremony marking the start of underwater construction today were Dutch Prime Minister Jan Peter Balkenende, French Secretary of State for Foreign Trade Anne-Marie Idrac, EU Energy Commissioner Gunther Oettinger, Chairman of the Nord Stream AG Shareholders’ Committee former German Chancellor Gerhard Schroeder, and Nord Stream AG Managing Director Matthias Warnig. 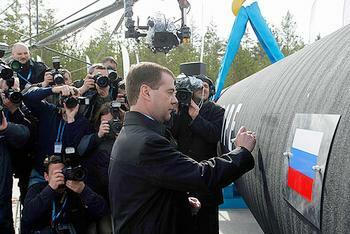 The Nord Stream gas pipeline faced environmental opposition from the Baltic and Nordic states, which favor an alternative, land-based gas pipeline linking Russia to Germany. Estonia went so far as to deny the project consortium the right to survey the Baltic state’s territorial waters, forcing Nord Stream to rely on Finnish cooperation to push the project ahead. Nord Stream received the last permit required to start constructing its gas pipeline through the Baltic Sea from Russia to Germany on February 12. The Finnish water permit complements the earlier permit granted by the Finnish government for the Nord Stream consortium to use Finnish waters. On the same day, February 12, environmental groups WWF and Friends of the Earth launched a legal challenge in Germany against the construction of the undersea Nord Stream pipeline. They claim German authorities failed to demand sufficient compensation for damage caused. 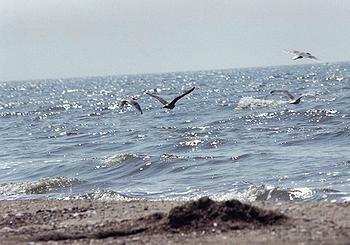 The challenge was filed with the administration tribunal in the Baltic city of Greifswald by WWF and the German affiliate of Friends of the Earth, BUND. The company says the lawsuit filed by the environmental groups is unlikely to impact its schedule. Jochen Lamp, head of the Baltic office of the WWF Germany, says the the gas pipeline, the largest structure in the Baltic Sea, has caused significant environmental damage but it is the greener alternative compared to transporting the gas by tanker from Russia to Western Europe. 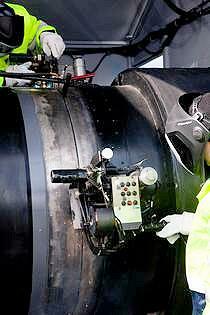 “The liquefaction of natural gas and the shipment pose greater risks than the transport through the tubes. On top of that would be associated with an energy of liquefaction of about 25 percent, which would in turn be bad for the climate,” said Lamp. Lamp is worried about the explosive mines still on the Baltic Sea floor in the Finnish and Russian zones. During the world wars of the 20th century, more than 150,000 naval mines are estimated to have been thrown into the Baltic, 80,000 into the Gulf of Finland.